First up, the “housekeeping”. In the flurry of our birthday hop on April 1 and the changing of the guard, as it were, we’ve been extremely remiss. We haven’t chosen the blog hop winners until now! We’re so sorry. Thanks to a few Facebook fans who inquired after the winners, we clearly needed that kick in the pants. And now, onto our May winners! The winner of the Simon Says Stamp gift voucher is Jenny Martin! The winner of the Mama Elephant prize (2 stamp sets of your choice) is Linda van Vliet! The winner of the Simon Says Stamp gift voucher is Jill! The winner of the Mama Elephant prize (2 stamp sets of your choice) is Mary-Anne V! Please send an email to ablognamedhero@gmail.com and let us know what you won and we’ll get you fixed up. I’m here with a solo post today, and I thought I’d share a quick project I whipped up using Sketchy Letters from Mama Elephant. We’ve all had SO much fun this month, collaborating with Mama Elephant, their stamps work just beautifully along side Hero Arts products. We hope you’ve enjoyed the collab as much as we have! I saw a quote on Pinterest a few weeks ago and just LOVED It. You know when a quote really sits with you for several days? This was one of those. I thought it would be perfect framed. love it. so so true. I often let myself get caught up in the ‘what ifs’ and the ‘but if only’s . They dont help, they just make me miss what’s right in front of me. So, time to read this quote, which is now sitting on my craft desk, DAILY. I just love the texture the Sketchy Letters give when heat embossed. SO basically, I used Hero Arts watercolour paper and embossing powder (it’s seriously the BEST), and heat embossed the sentiment using all Mama Elephant letters (so easy to do), then used some Distress Inks as paint, and sprayed the heck out of the inks and the paper, then dabbed it into the inks. Love love LOVE this effect. The swirl is from a Hero Art set too. That’s it for me! Nice and easy. This project only took minutes! 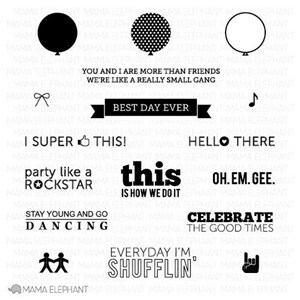 This month, our team has the great opportunity to play with Mama Elephant Stamps. THANK YOU, Mama Elephant! I simply love their cute stuff – all those little creatures and friends they come up with! And they make such a fantastic combo with Hero Arts Stamps. I know some people have a hard time combining stamps from different companies or different sets (Just like some people don’t like to combine papers from different pads). But there is one EASY way to combine supplies: By theme. And this is what I wanted to try out for this month’s video. I picked “stars” as my theme. There are TONS of supplies for this: Papers, Stamps, Embellishments, But I just picked some samps, a matching, simple technique and a few embellishments. No fancy paper this time. And here’s the video – I hope you enjoy it! So what about you – do you prefer to use supplies of just one company/set for your projects or do you like to mix them up? I didn’t use patterned papers – but I like to mix them up (by color, mostly). Thank you so much for stopping by – I am so proud people like what I do. THANK YOU! Now, don’t forget our current challenge!!!! As always there is a great prize to be won. And this month there is an extra prize thanks to Mama Elephant who are offering two stamp sets for each of our challenges this month – how awesome is that?! Thanks for the great collaboration Mama Elephant! I just love those wonky circles I see everywhere right now. I used them as a start and made three cards on the wonky circle theme. I got this new stencil and inked a wonky circle pattern with some lovely colors of shadow inks. Yummy! I think the Mama Elephant stamp is so cool! Then I started to think about if I could make my own wonky circles using my Cameo to make a card with inlays in different colors. I inked the white middle pieces in the same colors as on the last card and even though I made the black outlines a bit thin I loved this card! But then I had all these black left over pieces and did not want to toss them, I made another card. I was thinking a nice graphical black and white card would be cool. But when I was done it looked a bit… blah… I took my Envelop background stamp and embossed it over the whole card using clear neutral glitter embossing powder. And the card was not blah anymore I tell you. I took another picture from the side of this card and loooooooook at all that glitter! It looks even better up close. Very pretty! So, talking of embossing. There is still some time left to enter the current challenge 🙂 It’s all about embossing! This months sponsor Mama Elephant is giving away two stamp sets, they are so great and very fun! Love! I hope you all have a great weekend! See you soon! today I’m here with my second solo Post at ABNH. Still exciting. This time I’ve decided to showcase a little flip card. Because this month there is a collaboration with Mama Elephant (LOVE it), I’ve chosen the Stampset Nursery Decor for my card. First I’ve cut out my card base with the Sizzix CIRCLE Flip-its Card Die. Then I’ve stamped with my Canvas Stripes Background Stamp onto the side parts of my card (beside the circle). For the front of the circle I’ve stamped my images on a seperate sheet of paper. Then I’ve colored with copics, snipped them out and arranged it on the circle. For the backside I’ve stamped my images directly onto the circle. Finally I’ve glued some enamel dots on each side of the circle. Now here is the result. Thank you so much for visiting! Hope you had fun. Dont’t forget our current challenge!!! !